The Litter Box: With Friends Like Them, Who Needs Enemies? With Friends Like Them, Who Needs Enemies? 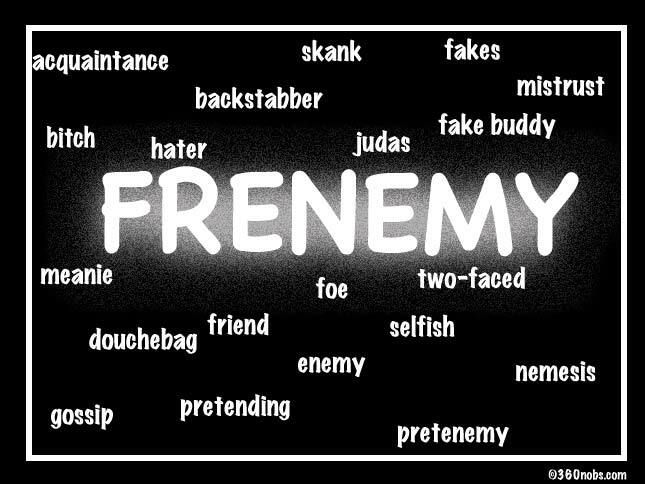 "FRENEMY" - The word might seem unnatural to you but believe it or not, such a word has been used many times by many people. If some people can have a love and hate relationship with someone then they can be friends and enemies with someone too. Yes, well, I told you relationships were messy and I didn't mean just the romantic ones but also the regular ones. Have I encountered some frenemies in my past you say? Hmm...Let me think that one through. Well, in all honesty, I can say I have encountered such people in so many different places. It is difficult to say that having one is a blessing for I consider it a ticking bomb just waiting to explode on your face. Fortunately, some frenemies do come and go which is why I can breathe a sigh of relief. Although the meaning of the term can different for some, here's what I think about it. Frenemies are your friends and enemies at the same time. Whether they are your true friends or not, that still leaves to be decided by you. I remember having this gut feeling about a certain person even before I got to know him. I hated him. I did't know if he felt the same for me. As time passed by, I began to know him better but I still didn't want to ditch this gut feeling I have for him. Perhaps it was my instinct telling me that he is bad news. Eventually, we came into a truce. We somehow came an understanding of things and became friends (if that's how you want to call it). But the bickering, the teasing, the sarcasm and everything bad did not end there. We still bantered and argued on many things however at the end of the day, there would always be a silent peace treaty going on in our heads. Oh, believe me, it was like reliving a battle over and over again. Every day was the same and it was draining the life out of me. Good thing, I was able to stay away and so did he. That wasn't the only time I encountered a frenemy. I guess I have met so many in my growing years. 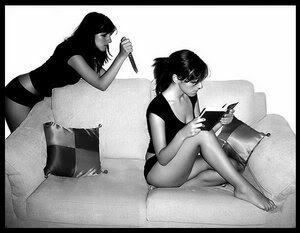 They may smile in front of you but behind you, it's like they are actually stabbing you with anything sharp that they can get their hands to. They may compliment you on the clothes you wear or the things that you do but when your back is turned and you are completely off guard, they start spreading rumors about you and even want to wage war against you. Why? I don't really know. Sometimes I begin to question myself if I am a likeable person or not. Many people have said I am but there is always this lingering doubt that grips me. I understand that I can be intimidating at times because of my snob self but I am not always like this. In fact, I consider myself a person who can adapt to other people if given the right amount of time. Just recently, I was surprised by the turn of events that happened near me. Someone I knew hated her old friend because she said that her friend left her hanging in one of the most important stages of her life. She clearly needed her and she knew she had been a good friend as she had always been with this friend of hers through thick and thin. She bore a grudge and along with that grudge came all the bitterness, the sarcasm, the backfighting, rumor mongering and so on. I felt like a therapist or a psychiatrist talking to a patient. It was horrifying. After all the gruelling days and weeks of listening to her rant about this certain friend of hers suddenly I grew fed up and locked myself away. I didn't want to her anymore of it. Sure, she hated her but she could at least last a day without saying anything bad about her. I mean come on. A few months later, I was back to my cheery self and was able to function normally again. I spoke to her again after so long and this time to my surprise, she was talking to her so called friend that she used to hate. In the back of my head, I was thinking: What the heck happened while I was locked away from the world? I simply shrugged, shook my head and smiled. They have kissed and made up. After everything that had been said and done, they were friends again. I can't imagine how awkward it must have been. Yes, they are the perfect example of frenemies and I can never deny the fact that they looked ridiculous during their moments of hating each other. I am just relieved that they are back together again. Is having frenemies healthy? Perhaps so but I think I only need a little dose of frenemies every now and then as I do not think I can handle way too much frenemies at one time. Did I learn from my experiences and the experiences of other people regarding frenemies? Perhaps yes however, not all frenemies are the same and not all situations as to why they became your frenemies are similar either. So, I guess it is a learning process. I can't say I love having them but I can't say I don't want to have. Like what I said, it is a love - hate relationship. What more can anyone ask for? Whether they are your friends, your enemies or your frenemies, be grateful that you have them for not all people have people who care for them so cherish them while you still have them for you will never know when you are going to lose them. Our lives are short in this world so we should make the most out of it. We may not know when the clock will stop ticking but at least, we had the time of our lives. Friends, Enemies or Frenemies, I say bring it on! Call them whatever you want to call them. Define them however you wish to do so but you have to understand that FRENEMIES are everywhere no matter how hard you deny it. FRENEMIES come in all shapes and sizes. It can be your friend, your best friend, your co-worker, your cousin. Point is, it can be anybody. Be wary! FRENEMIES know your weaknesses and might even expose them in the end. They can either destroy you or not. That choice is not up to you but rather up to them. Well there are so many examples of FRENEMIES in Hollywood. Let's just say it is a lot common out there than in the real world. Which is why I sure don't want to be in their shoes. oh the good old frenemies, we all meet them.